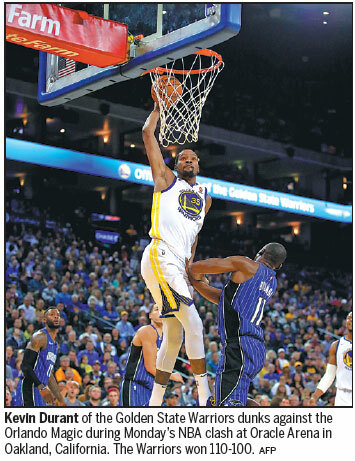 OAKLAND, California - Kevin Durant had 21 points, a season-high eight assists and seven rebounds and Shaun Livingston contributed a season-best 16 points substituting for the injured Stephen Curry to pace the Golden State Warriors to their seventh straight victory on Monday night - 110-100 over the Orlando Magic. Draymond Green had a season-high 20 points, five assists, four rebounds and two steals as the Warriors completed an unbeaten four-game homestand. Nikola Vucevic scored 20 points, Evan Fournier had 16 and Aaron Gordon added 10 points and 10 rebounds for the Magic. With Curry sitting out to nurse a bruised thigh, Livingston also had six assists. Durant sat out with the same injury as Curry's last week against Minnesota, and coach Steve Kerr said the Warriors are being cautious with two-time MVP Curry, who watched from the sidelines on his bobblehead giveaway night and has only been receiving treatment on the leg without any on-court work. "If it was a playoff game Steph would play, but he's pretty sore," Kerr said. "We've got two days before our next game so this gives us the chance to really get him healthy and right. It's a no-brainer to rest him." Klay Thompson contributed 15 points, five assists and four rebounds in Golden State's ninth straight victory against the Magic and fifth in a row at Oracle Arena. Golden State held the Magic to 19 points in the third quarter while scoring 32 to take control, leading 88-75 going into the final 12 minutes. Livingston made his ninth start for Golden State and first since April 8. Rookie Jordan Bell was inactive. Center Damian Jones was recalled from the G League but was inactive after Kerr wanted him to take part in morning shootaround and be around the team. KD credits the former 49ers pivot for "being courageous". "Kap is just a guy who's standing up for what he believes in, standing up for people who don't really have a voice," Durant said. "It's a tremendous honor to be on the cover with him, somebody that his words have started a conversation that's needed in this country. And his actions have started a conversation. It's an honor, it's a blessing and I'm definitely grateful to be on the cover with an amazing guy."